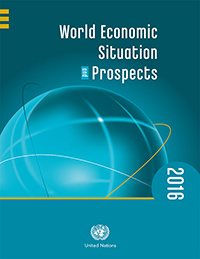 India will be the world's fastest growing large economy at 7.3 per cent in 2016, improving further to 7.5 per cent in the following year,says the United Nations World Economic Situation and Prospects 2016 report launched today. This report expects the Indian economy, which accounts for over 70 per cent of South Asia's GDP, to grow 7.3 per cent in 2016 and 7.5 per cent in 2017, up from an estimated 7.2 per cent in 2015. South Asia is expected to be the world's fastest growing region in 2016 and 2017 despite challenging global conditions, the report added. "India's economy, which accounts for over 70 per cent of South Asia's GDP, is projected to grow by 7.3 per cent in 2016 and 7.5 per cent in 2017, slightly up from an estimated 7.2 per cent in 2015." India will be the fastest-growing large economy in the world, said World Economic Situation and Prospects 2016, which was released by the UN.